“I want to pierce my nose”, I declared on a cloudy Saturday morning. My parents looked perplexed. I was super excited and I went on ranting. I told them that I am confused whether to buy a traditional white stone or a more rebellious black! My parents continued to stare at me with a horror-stuck face. Finally my father asked, “Are you serious?” I said, “Of course I am. Why wouldn’t I? “Have you forgotten what happened last time?” My father asked. An array of memories flowed in my mind. It was almost 4 years before. After convincing my parents and myself, I decided to pierce my nose. I googled, I consulted friends, family and many other random people. I was excited and tensed at the same time. I was confused whether to go to a Goldsmith or go for gun-shot. After research and more research, my parents and I unanimously agreed to go for a gun-shot. We presumed that nose piercing will be done in a shot and there would not be much pain. An auspicious day was chosen and we went to a reputed jeweler. I was made to sit on a tall stool… The kind you get to see in Kaun Banega Crorepathi. I was totally uncomfortable. I feared that I may jerk and fall down and my lips would be pierced together instead. OUCH!!!! The gun-shot machine had got stuck in between… And the salesman was desperately trying to pull it off my nose. I started crying and the sniffs of cries only triggered the pain. It was intolerable! After a Himalayan effort, he separated that gun from my nose. Blood started flowing and I saw myself in the mirror; horror followed. I pleaded that I don’t want any more nose piercing episode. But, they didn’t let me. Everybody said that mark would stay as a scar. Before I could decide, he shot the gun again on the same wounded spot. I cried in pain. My parents stared at me helplessly. I endured the pain for almost two weeks. And the twist in tale is yet to come. One fine afternoon, I realized that the nose-pin had fallen off! Coming back to the present, my parents realized that I was too determined to be convinced. So we headed to a jeweler. 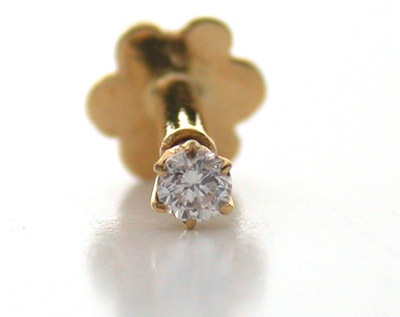 Chose a small nose-pin with white stone and met the Goldsmith. And my nose was pierced. I didn’t shred a single droplet of tear. I came back home happily. May be this is why they say… never ever give up?! Way to go girl! I had to beg my folks to get my nose pierced. Never regretted it! gR8 to see that yu again pierced ur nose..